In this 5-minutes video you will learn how to use Telerik Controls for ASP.NET AJAX and Telerik's Visual Studio Extensions to quickly create a form for entering profile-like user information. EmptyMessage="Enter first name" Label="First" LabelWidth="64px"
EmptyMessage="Enter last name" LabelWidth="64px" Width="160px"
Telerik RadLightBox's templates are useful when you want to extend the capability of the control. 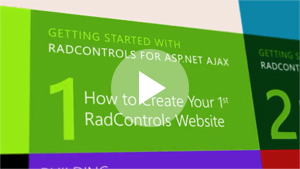 You can embed any content inside a RadLightBox template, including HTML markup, iframes, ASP.NET server controls. You could use ItemTemplate to customize the look of the item zone and use DescriptionTemplate to customize the look of the description zone. a form for entering profile-like user information. <telerik:RadButton RenderMode="Lightweight" ID="CodeButton" OnClientClicked="demo.openCodeLightBox" AutoPostBack="false" Text="Get the Source Code" Skin="Silk"
<telerik:RadButton RenderMode="Lightweight" ID="FeedbackButton" OnClientClicked="demo.openFeedbackLightBox" AutoPostBack="false" Text="Share Your Feedback"